Okay, so now that I’m on the “eating clean” game, I’m trying to incorporate green smoothies into my diet. In the past, I found it difficult to be consistent as I HATE grocery shopping weekly to get fresh produce … and I never have enough time to do all the rinsing/washing/ peeling/de-stalking, etc. that is required. So, stuff inevitably spoils and has to be trashed (I HATE being wasteful of my money and food even more than I hate grocery shopping). So, when someone suggested I use frozen veggies in my smoothies to eliminate the need for ice, I had an “Ah Ha” moment!! Forget not using ice. From what I’d read, frozen veggies might be even better than fresh!! The nutrients of fresh vegetables begin to deteriorate from the instant they are harvested. Results from the Institute of Food Research presented in the NY Daily News reveals that fresh vegetables such as green beans lose 45 percent of their nutrients; broccoli and cauliflower, 25 percent; carrots, 10 percent; and peas up to 15 percent after 16 days of storage. With fresh vegetables, you never know how long it has been since they were picked and the amount of nutrients that were lost en route to the market unless you are buying from a local farmer. With vegetables that are frozen in their prime, you can savor most of the nutrients that were present at the time of freezing. As much as I use frozen veggies to supplement my Lean Cuisines, I don’t know why I never thought to use them for smoothies! DUH!!!! I mean, they are frozen at the peak of ripeness, hence nutrient rich. They are already washed and cut. They can last for months in the freezer!! And most of the time, they cost far less than fresh produce!! How much more economical, quick and convenient can you get?!?!? That being said, I picked up some frozen spinach (which I always keep in the freezer) and kale at the grocery store last week and whipped up the green smoothie above last Saturday! With protein, fiber, Omega-6, potassium and a variety of other vitamins and minerals, it was a perfect post-workout recovery meal! Do you use fresh or frozen veggies in your green smoothies? If you use both, which do you prefer fresh and which do you prefer frozen and why? I use fresh spinach, kale, and arugula but the fruits I buy frozen (strawberries, pineapple, peaches, etc.) I shop at Trader Joes so I get the frozen fruit at a good price. Sometimes I will cut bananas and freeze them as well. I love green smoothies. Last week I tried a sweet potato smoothie and it was so good. I baked the sweet potato in the oven for an hour or until it was soft. After I let it cool down I peeled the skin off, threw in half of the sweet potato, handful of spinach, a few frozen banana pieces, almond or coconut milk, a dash of vanilla extract, dash of cinnamon and blended it in my Nutribullet. It was so good. Anyhoo, enjoy the green smoothies. It’s definitely a great way to increase your fruit and veggie intake. I know it has for me! Jas, I LOVE sweet potatoes, so that sounds AWESOME!!!! I TOTALLY have to try that!!! I need a Nutribullet or Vitamix. I may just start with the Nutribullet and will upgrade to the Vitamix at some point if I’m using the bullet regularly! Try a nutri ninja – I just got a 900w one for £30 cheaper than a bullet! I have the Nutribullet and the Vitamix but I prefer the Nutribullet because it makes a smoother drink! Please visit our site. We offer pre-packaged Green Smoothies just for the reasons you stated above. Most people either dont have time or dont like to do the constant grocery shopping, cutting and chopping required for daily green smoothies. I prepare about 30 bags with all my fruit and veggies. It’s so much easier to just grab a bag every morning and put in my nutri bullet. I put everything In except the seeds. I’ve also found that it you want it a little sweeter add a little bit of flavored water. You will be amazed. I live in the landlocked Midwest where this time of year, nothing is alive within 100 miles, so frozen is my best bet right now. But as the weather get warmer, I have to go with team fresh. Frozen spinach and carrots do not taste anywhere any their fresh counterparts. I love fresh grilled spinach, but in my LCs and smoothies, I’m fine with frozen. Carrots I only do fresh, but they last forever and I can get peeled baby carrots, so they are easy to work with as well!! Wow! How does one grill spinach? When I read this article, I had a v-8 moment! I’ll definitely be incorporating frozen veggies in my smoothie regimen! LOL!! “V-8 moment!” LOL! Love it!! Glad that this was helpful!! I bought some frozen spinach last week per your suggestion. So much easier! I don’t always feel like making smoothies every day and usually have to throw away some of my produce at the end of the week because it starts to spoil. I didn’t have to do that this week! I also like the idea of adding frozen spinach to my frozen dinners! I’m going to try that also! I have been drinking green drinks for two years now. I have one every morning for breakfast and often for a postworkout recovery after a particularly strenuous workout. When I first started making them, I went totally wild on the ‘green’ concept and put in 4-5 different types of fresh green veggies (spinach, kale, dandelion beet and bok choy greens) , as well as a myriad of fruits (lime, kiwi, pineapple, ginger). I would make a big one in the am and have two servings (one for breakfast and one for a mid day snack). I did this for a year and a half. I’d even freeze my drinks the night before traveling and take them with me if I knew I was going to be in a place where I would not be able to make them! I am crazy about my green drinks! I spoke with a fitness expert and a nutritionist to find out what I needed to do. Well, long story short, I simplified my recipe and was able to lose body fat, increase lean body mass and get to a better place of overall fitness rather quickly by doing so. My green breakfast drink now only has 2 types of fresh kale, a few frozen strawberries, almond milk, alkaline water and a scoop of vegan protein powder. I always use fresh veggies and frozen fruit for all my drinks. The frozen fruit does replace the need for ice. I prefer fresh greens, as they make my drinks taste ‘fresher’/greener (don;t know how to explain this, but to me there is a distinct difference in the taste). I use a blended (Vitamix) rather than a juicer, to maintain all nutrients and fiber. Extracting the pulp eliminates nutritional value. Sometimes, I make delicious fruit juices by extracting the pulp using a juicer, but remain mindful of the fact that juices (even natural ones) are loaded with sugar. Blending is also easier, as you just throw the stuff in, cover with lid and turn the machine on. The Nutribullet is a good one and is not as expensive as the Vitamix and Kitchenmaid blenders. I must say that since I have been drinking green drinks regularly, I have noticed an increase in energy, my skin looks and feels better and my energy during workouts has increased tremendously. I have recommended drinking green to many people. Shelli, thanks for sharing your experiences with us!!! Thank YOU for sharing your experience Zenith!! I’ve juiced before as well (juicer has been collecting dust under the sink). While I loved the way I felt, it was just far too much work and I like getting the fiber too! I can understand what you mean by the “fresher” taste. But, I’ll sacrifice that for the ease and convenience ;)! But, again, totally understand and get the fresh route on green leafy veggies! Thanks again for the feedback!! Good idea but make sure you’re reading the ingredients some frozen veggies have salt and preservatives in them. I’ve read about that, but have never had that problem. Good point though! Thanks! I jumped on the green smoothie wagon after my friend told me about simplegreensmoothies.com. They have a 30 day challange coming up for April. I did the 30 day smoothie challange in January where I was pretty successful drinking smoothies daily and I incorperated so many more fruits and veggies in my diet.Plus they send you a shopping list and recipies weekly with a specific theme. They had a lot of variety and the smoothies tasted good. Most of the fruits and veggies I used were frozen unless I saw them at a good price. Only exception was bananas and raspberries ( I always find frozen raspberries to be sour :p). I also just use a regular blender, nothing fancy. 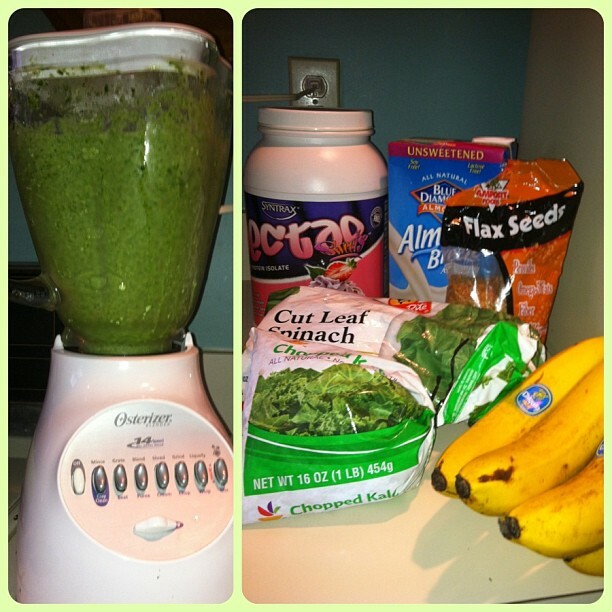 Just blend the greens first so you dont get stringy chunks in the smoothie, especially if you use kale. That is one tough green. Spinach does great though. Thaw the frozen fruit a little bit too so it all blends smoothly. BTW they are on instagram as well which I found helpful seeing the smoothies and ingredients, it motivated me. Being a typical and probably lazy male, I like to keep things simple and easy….so I buy about 3 lbs of kale, 3 lbs of spinach, and 3 lbs of carrots…all frozen. Then I dump all 9 lbs into a large plastic bag, mix it up with my hand for about a full minute, then put the huge bag of pre-mixed veggies in the freezer. So each morning I just have to reach in bag and grab 3 good handfuls of already mixed veggies and put in my blender…..then just add the water, frozen berries, a pre-frozen banana, ground hempseed, and ceylon cinnamon. 9 lbs of veggies lasts almost 2 weeks. When they’re gone I buy 3 different (to rotate) veggies and do it all again…having 9 lbs of pre-mixed greens makes the process soooooooooooo much easier and faster!…………but mix them altogether as soon as u get home from the grocery store…..before they thaw. 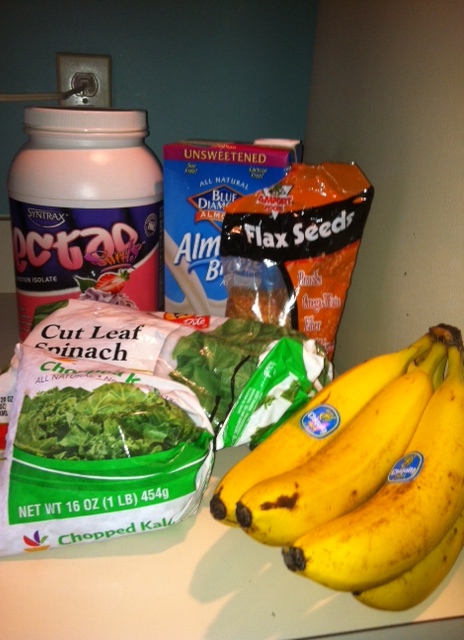 Thanks so much for sharing your method of green smoothie prep. Fresh greens tend to be extremely perishable, even as I am preparing green smoothies daily. Many times I must go to the grocery store just for the greens! I am now inspired to prepare my frozen greens combined together in one large freezer bag, as you suggest, without worrying about the spinach and kale going bad! I read that you should cook frozen vegetables first unless stated on the packaging that they can be used without cooking. Has anyone heard this? I’m also curious about steaming veggies before bitzing. something about nightshades, goitrogens, oxcalates..all natural components found in veggies that cause inflamation to the thyroid gland, goiter, kidney stones…….i was told that steaming veggies reduces these substances dramatically. I thought i would blend the veggies after in the blender. Lol!!! Awesome!!! Awww, thank you Tia :)! Spinach is often part cooked when you buy it frozen so it may not be as good for you as fresh. I just googled using frozen vegis in smoothies because I have been doing this for some time. I get them from whole foods and they are frozen fresh. However, I was upset to read the label this morning that said, for safety heat to 160 degrees. This makes me very concerned about using the frozen vegis in my smoothies, especially the ones I am packing into the pouches for my little ones. Does anyone know about the safety of using frozen vegis in smoothies?